On Saturday, I ran the Eye Ball The Wall for the third time. I was stressing out about this race all week. 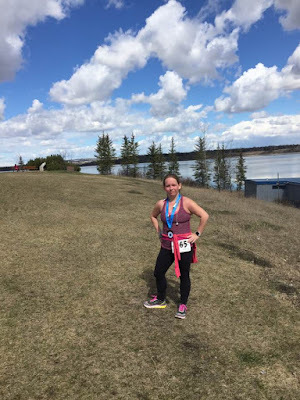 Despite knowing that I had trained hard and properly for this race, my hips had been tight all week to the point where it hurt when I walked plus I was worried about my toes and running form. I have a really bad tendency to not always have the faith in myself to finish races or run them well but thankfully, I have a great set of friends who are there are to remind that I can and encourage me. They are the best. This was by far the best weather we have had for the Eye Ball The Wall. The first time I ran it, it was so cold that I never even sweated because the wind off the reservoir was insanely cold. The following year, I overdressed because of the year before and was so hot. 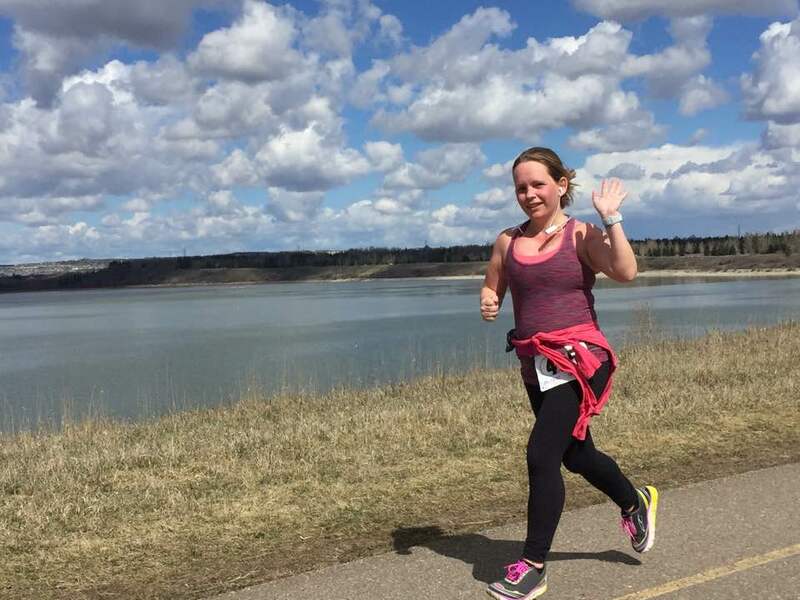 This year, it was warm enough in the morning that I was only slightly cold and I soon stripped off my Lululemon 5 mile shirt (best running shirt out there). The downside to the nice weather was the fact, it was the first warm day most of us had run in a very long time. Literally 2 days before this, I ran in the snow with a buff and toque on and wasn't overdressed. This meant for severe dehydration and we were all so salty when we finished. Greg ran it with me this year and by that, I mean we registered and started but he was long gone ahead of me soon enough. He finished earlier then me and was waiting on one of the benches and got a few photos of me running which I really appreciate that he did. I finished and I didn't self destruct either. My hips didn't bother me, my toes felt alright although I felt like I was getting a blister on the ball of my foot like I did in the Banff Half Marathon last year, but there was nothing there. I finished in 1:53:53.3 which was 8 minutes longer then last year but about the same as I did in 2015. Both this year and in 2015, I was coming off injuries and I ended up destroying my PR twice that year so I am hoping I have similar luck. I lost about 4 minutes using the bathroom because I thought I was going to die so really it took me 1:49 unofficially. 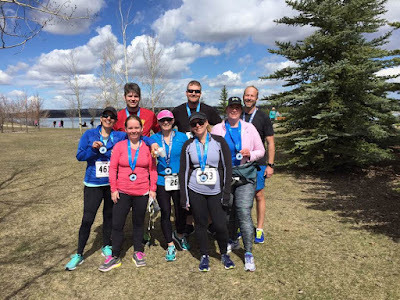 This is only the second time I have used a bathroom during the race, the last time was also in 2015 but it was during the Calgary Half Marathon. Despite my time not being the best, I am really happy with my run. 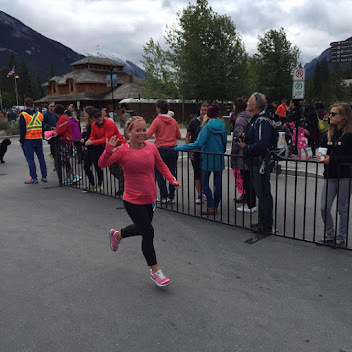 I think I ran with relatively good form and don't really remember running on my toes. Shannon was running the 30km and she said that when she passed me on the trail, she didn't notice that I was bouncing or anything so that's good. I passed my friend Heather at one point and she said that I was still running on my toes but nothing like I used to do. I was happy hearing this because I am making some progress. I am just hoping that my speed comes back as my form improves! My only complaint about this race is that all the bathrooms are all grouped together in like a 6 minute radius which is not beneficial and I think they could add another water station too or move the 2nd one to near the hospital because that is after a bunch of hills and the water would be so good there. I seriously cannot emphasize how much I appreciate the ladies in this photo. They are simply the best and I wouldn't be where I am today without their encouragement and support. We , along with other girls who didn't run on Saturday, have a really good tribe who inspire each other with every run, workout, bootcamp or yoga session. We all want each other to be better and I love that. There is no jealousy or competitiveness amongst any of us which can be rare with a group of women. So even though you may not love all the social media posts that we do about our workouts or successes, those posts can encourage one of us in so many ways. Thanks ladies as always. 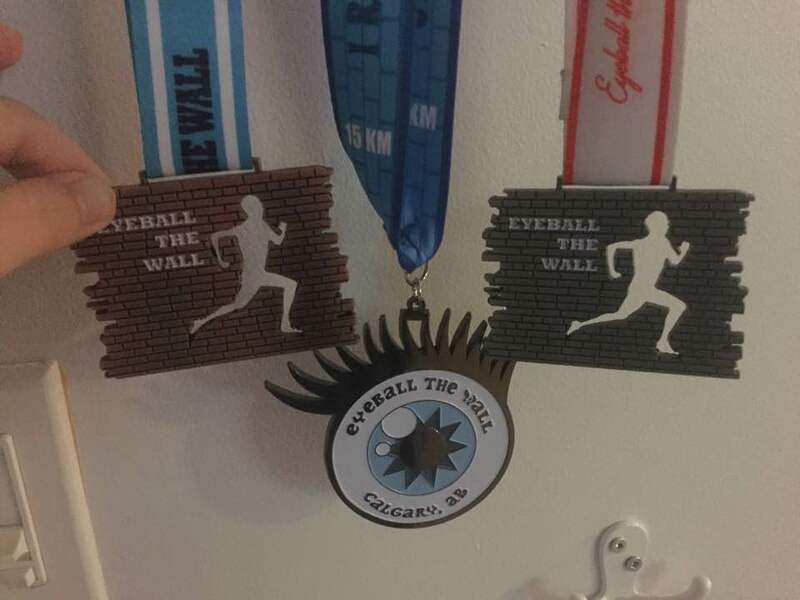 Here are the medals from all three Eye Ball The Walls - 2015, 2017, 2016. I am really glad they switched up the medal this year and it is freaking awesome. It might just be one of my favourites!